that has changed the way we use and store email. also be used for accessing other Google services like Picasa, Web history etc. There are two email domain names in use by Google for email, they are the normal gmail.com, and the googlemail.com (UK and Europe). Although Google users in Europe may have to register a googlemail.com address they can still use the gmail.com address as mail to the user@gmail.com is sent to user@googlemail.com and vice versa. To access via a browser go to the Gmail Home page http://mail.google.com/ , you could also set it as your home page for faster access. 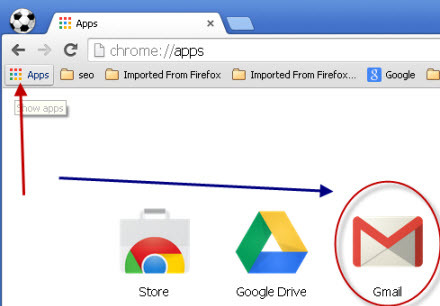 If you are using Google Chrome then go to the Apps Tab and click the Gmail icon. If you are using a smart phone or tablet then download and install the Gmail App. Gmail will copy email to your computer and so you can read and reply to email off line. sent. It is enabled under settings>offline, and requires gears to work. or IMAP4, and place that email in your Google Mailbox. email from multiple mailboxes and/or use Gmail simply as an email client for another email account/address. See Access and Consolidate email accounts using Gmail. Google make money from Gmail by placing context based ads in the email messages just like you see on this web page. Although this can be seen as a massive privacy issue Google maintain that email is kept totally confidential. From a big brother perspective it has always been possible for anyone at any of the ISPs and other nodes on the Internet to monitor email, and so in my opinion Google Ad placement is not really a concern. However email encryption is not without its own set of problems. Gmail is very popular for mobile clients due to the fact that Google owns the Android operating system that is used on many smart phones and tablets. Google provide Apps for IOS as well as Android. Here is a good video Introducing Gmail..
You can access your email using traditional desktop clients like Windows live mail as well as Apps on your smart phone and Tablet. Q- Is Gmail Secure ? A- Yes the web client using SSL encryption by default. Q- Can I create folders on Gmail to organise my email? Q- I’m receiving email from someone and I don’t want to receive emails from them What Can I do? Q- How do I see all of my archived emails? A- The All mail label links to all of your emails including archived email? Q- What happened to Gmail notifier? Read, Reply and Forward Email in Gmail-Learn how to Read, reply and forward emails using wht web browser client. How to Consolidate Email Accounts in Gmail – Use Gmail to read email from other mailboxes. Access Your Gmail Account using Windows Live Mail– If you prefer to use a desktop based client rather than a web browser.